Pool Care Solutions can help you build the perfect pool environment with Jandy professional-grade swimming pool equipment and the iAquaLink automation system. Pool Care Solutions is your go to service provider for Jandy Pool and Spa Controls and AquaLink Automation Systems. Take control of your backyard experience with the most user-friendly, innovative pool automation and control systems on the market. 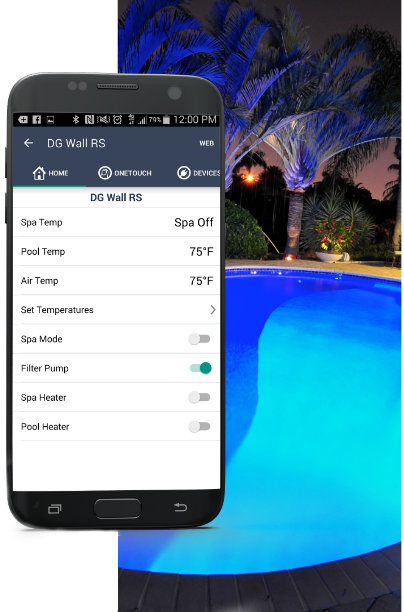 Access pool and spa features via smartphones, desktops, and tablets through the intuitive, convenient, and award-winning iAquaLink app. Intelligent pool control from your smartphone, tablet, or web-connected device. We can install the system at your pool equipment and you can control everything from an app on your phone. Turn on the pool heat from your home in San Francisco a day before you arrive to your Palm Springs vacation home. At a restaurant thinking about a night time soak. Pull out your phone and turn the spa on so that it's warm when you get home.